Sales of existing homes posted their first increase in six weeks but are still down by over eleven percent in the last four weeks according to the National Home Sales Snapshot released by DataQuick. There were 166,980 properties sold over the previous thirty-day rolling period ending February 27th, 0.8 percent above the previous week’s total of 165,660 sold properties but 11.4 percent lower than the 188,454 properties sold four weeks ago. It was the first time in six weeks that home sales have posted a gain. Sales volume was 38.1 percent below this year’s cycle peak of 269,817 sales which occurred during the 30-day rolling period prior to September 12th of last year. Last week’s home sales volume was 4.4 percent lower than the 174,598 homes sold during the same period a year ago but was still 13.2 percent higher than during the same period three years ago when 138,603 homes were sold. 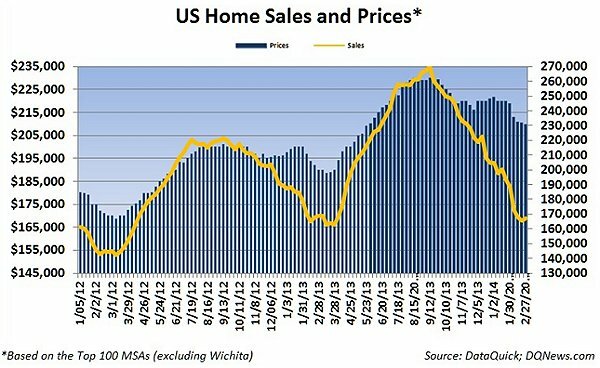 It was the eighth consecutive week that home sales have fallen below the previous year’s levels. The median price of a home sold over the current thirty-day rolling period fell by $ 600 to $ 209,900 after falling by $ 500 the previous week. Four weeks ago the median home price was $ 219,000. Home prices were 12.5 percent higher than during the same period a year ago when the median price of a home was $ 186,500 and were 21.3 percent higher than the median price of $ 173,000 during the same period three years ago. Over the last seven years, median home prices nationwide have ranged from a high of $ 275,000 to a low of $ 168,500.